Punk in spirit, riffing through roots-dirty, Stones-esque hooks, The Piggies — led by Andy Maltz of The Little Killers — exemplify the good-time, vinyl-hugging rock'n'roll and straight-to-tape aesthetic most bands can only hope for... The Ringleaders is another scorching band featuring rock'n'roll legend Larry May (Candy Snatchers/Born Loose). 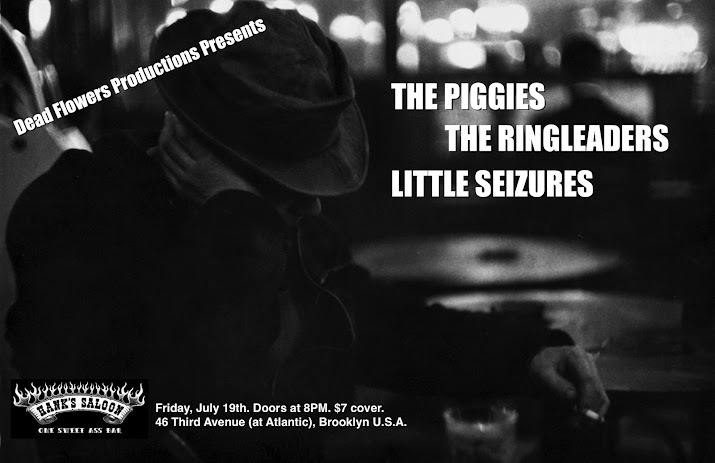 Tonight's show celebrates the release of their new album on Black Lung Records... Little Seizures — featuring members of The Shemps and The Mess Around, among others — thoroughly rocked Hank's in June so we hadda have them back ASAP! Doors at 8PM. $7 cover. 21+.